If you need grub control in Quebec, it is important that you receive the personalized and effective care to keep your lawn and landscape healthy. The services provided by EspacesVerts® are designed to effectively manage the grub problems that have appeared in your lawn and landscape. It's all aimed towards one result: achieving a vibrant lawn and landscape that you can truly enjoy for seasons to come. That's how you know you can count on us for effective grub control solutions in Quebec. On top of that, our high-quality solutions not only help you achieve your ideal landscape, but also come complete with friendly and helpful customer service. That means when you enlist EspacesVerts for grub control in Quebec, you’ll get the beautiful lawn you’ve always dreamed about — and if you aren't completely satisfied, we will keep working until we get it right or refund the cost of your last treatment. Get a detailed lawn care analysis today. EspacesVerts grub control will give you the results you want by addressing any problems that may be a threat to your landscape. Our talented customer service representatives can design a grub control program that will not only enhance the look of your lawn, trees and shrubs but also take care of your pest problems. After all, the most effective treatments are tailored for the individual needs of your landscape. Enjoy beautiful, beautiful lawn this year with help from EspacesVerts. 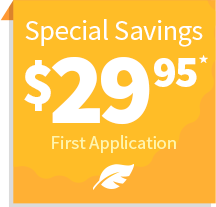 Ready to enjoy the benefits of grub control in Quebec from EspacesVerts? Call your local experts at 866-644-8155 for a free estimate today. Call EspacesVerts now at 866-767-2711 or fill out our form.